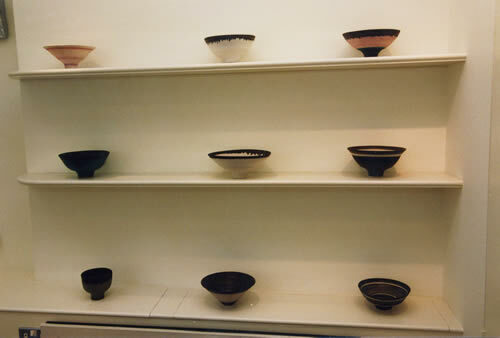 The work resulting from Lucie Rie’s long career astounds by its consistency. How is it possible she could have lived through such a turbulent period of history, and of art history, yet have remained so true to an aesthetic she discovered in the 1920s, producing year after year work so delicate yet so assured? Her slender frame, one surmises, must be driven by au undeviating will. Lucie’s consistency is more readily appreciated now than it was in mid-career, not least because she herself has been inclined to play down her Viennese background. It is inconceivable that she should have emerged from training under Michael Powolny at the Vienna Kunstgewerbeschule, where she gained the support of that powerful character, Josef Hoffmann, without absorbing lessons unavailable to the contemporaries amongst whom, after 1938, she was to work in England. Her quite natural eagerness to put behind her all memories of a place associated with a marriage now terminated, and where her relatives had been shunned or persecuted by their neighbours, would have been reinforced by the prejudices and sheer insular ignorance concerning the Secession movement and the Wiener Werkstätte that she would have encountered among her new friends in England. Not that these new friends had nothing to teach her. Bernard Leach in particular was invaluable both for the technical advice he gave and for restoring her belief in the seriousness of the Potter’s calling. Yet the very warmth of his welcome, and her consequent attempts to conform with the tenets of his Anglo-Oriental school, produced the only serious digression in the otherwise straight path of her development, resulting in some of the least satisfactory pots of her entire career. It was perhaps fortunate that the Second World War brought a respite, through interruptions in her work as a potter, giving her interludes in which, with a small band of helpers, she earned a living making divertingly individual ceramic buttons at a time of national austerity. The very idea of button-making came to her from a Viennese friend, Fritz Lampl, in whose glass button-factory in Soho she for a time found employment. As Tony Birks has observed, her brightly coloured buttons can be regarded as a return to the spirit of the Wiener Werkstatte; no wonder Leach frowned on this activity. Yet Lucie’s buttons were not merely a reprise of past experience: to look at a tray of them gives me something of the same feeling as examining the slivers of ceramic material, variously composed, glazed or fired, whereby Josiah Wedgwood established the technical properties of his future production. 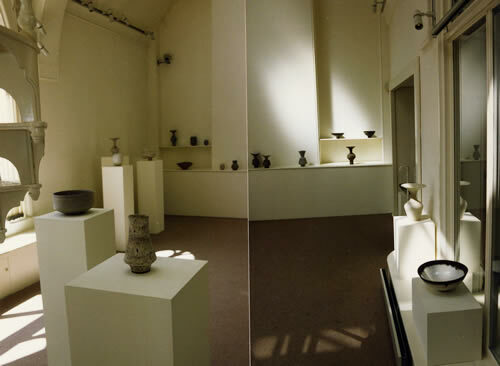 It is by now a commonplace of ceramic history that Hans Coper, who joined the reopened button factory at Albion Mews in 1946, restored Lucie’s confidence in her own ceramic identity, as she reverted from button-making to the production of hollow wares. Trained in pre-War Germany as a textile designer, but with strong inclinations towards sculpture, Coper was hardly likely to fall for the rural Utopianism of the English Arts and Crafts Movement, still less for the convoluted aesthetic of the Japanese tea ceremony. 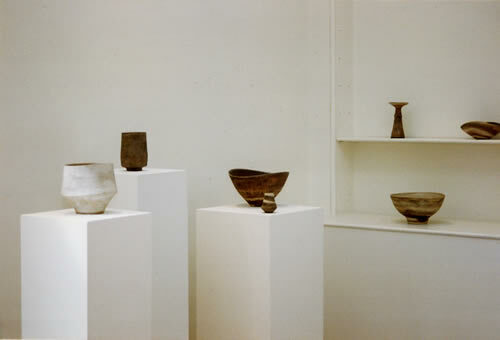 The relationship between Lucie Rie’s work and Hans Coper’s is complex, and comparisons between the two have often been made to Lucie’s disadvantage, a view encouraged by her modesty and quite unjealous admiration of Coper. Yet to compare Coper’s mature work with Rie’s is an exercise as meaningless as comparing chalk with cheese. Coper was twenty-six when he joined the button-workshop in Albion Mews, so despite being eighteen years younger than Lucie Rie he was no malleable youth, particularly not after the almost unbearably harsh circumstances of his early manhood as a refugee. Without Lucie he would never have found the profession of pottery, and most of his technical knowledge was acquired from her, though she once told me she had encouraged him to learn from Heber Matthews “the English way of throwing”, which she considered so much better than the way she had learnt in Vienna. “But he only needed to go three times”, she added. I was also once told by Lucie that in the thirteen years they worked in close proximity in the same small workshop she had never watched Coper throw: he didn’t like being watched. Only at the very end of his working life, when he was crippled by the disease that was to kill him, did he allow her to observe his rhythmical actions at the wheel, something he had never permitted at the time when many of their wares were collaborative or otherwise virtually indistinguishable. As Coper’s work emerged from the phase of collaboration his sculptural bias became manifest. 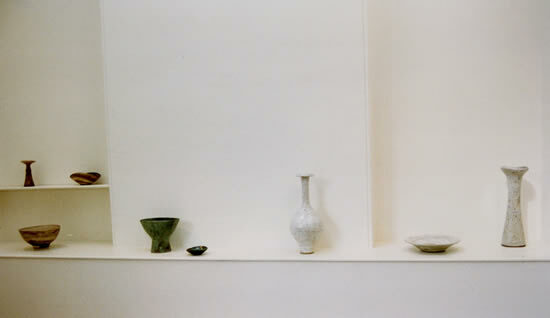 Though many of his pots are admirably suited to hold flowers or branches, and though Lucie so uses those in her own possession, his mature work has more in common with the Cycladic statuettes he admired, or with Brancusi’s abstract forms, than with the ceramics of Jingdezhen or St. Ives. Coper made little use of colour and his interest in surface was subordinate to the expressive possibilities of external and internal volume, and of the fall of light upon form. Lucie’s work, on the other hand, though stimulated by the ideas of urban architect friends, remains utterly loyal to the craft of ceramics. In it we are constantly reminded of the wheel’s dominant role and, even when she adds incised or gouged decoration at a subsequent stage, these seem metaphors of the way the pot has spun and grown under her hand, or even of the chatter-marks that can occur during turning. She has the true potter’s fascination with the haute cuisine of slips and glazes and, despite an impatience with the unpredictable results of firing, a willingness to learn from those accidents she can repeat. No other potter’s work offers greater variety of tactile experience: here a silky slipperiness like skin; here dryness like blotting-paper; there a scratchy and cratered surface. Lucie herself particularly admired the precision of form in Hans Coper’s work, which she considered beyond her own scope. It is true that any potter who accepts the atmospheric, painterly qualities proffered by glaze has to trade these against a certain loss of sculptural precision. It can also be said that, though Lucie has always enjoyed the company of people with strong intellects, she herself, at least since her arrival in England, has been an intuitive worker, thinking with her hands and even allowing her pots to wobble a little with a life of their own. It has to be admitted that her work includes some rare specimens of not wholly successful shapes, but she seems always to have recognised these and not persisted with them. Her most successful forms are those which she has used and refined over many years. She has never lacked the skills in throwing and turning to produce a tense profile when she requires it. 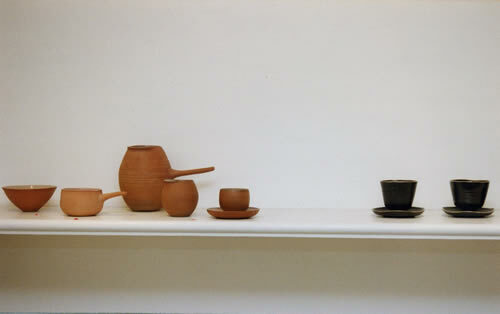 The pots in the present show range in date from the 1930s to the 1990s, each piece vital and unique, and yet the similarities between early, middle and later work seem to me more striking than the differences. A straight-sided vessel with bubbled “volcanic” glaze made in pre-War Vienna has much in common with a piece made in 1990. 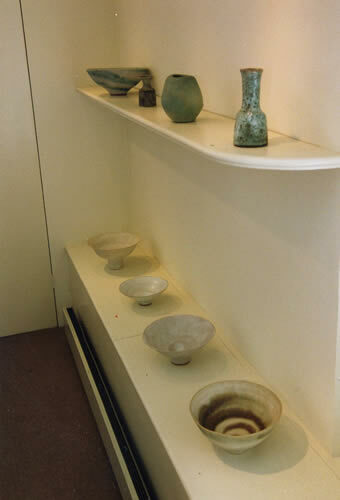 It is true that a certain discontinuity in the development of her glazes occurred when, in 1948, she abandoned earthenware and installed at Albion Mews an electric kiln capable of firing stoneware and porcelain at 1260°C. Even this radical change, it could be argued, followed the direction indicated by her earlier work, rather than dictating new paths to her. 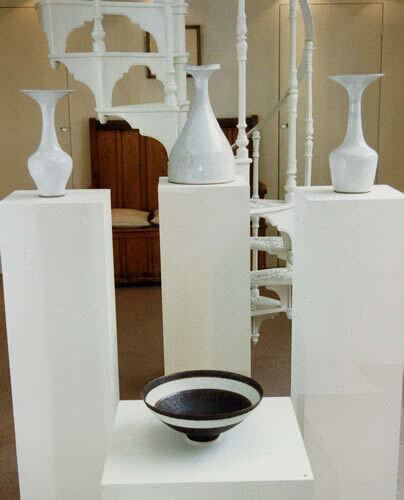 One recalls the oft-quoted criticism by W. B. Honey of the work she had brought with her from Vienna, that she had employed stoneware glazes upon .soft1 earthenware bodies. 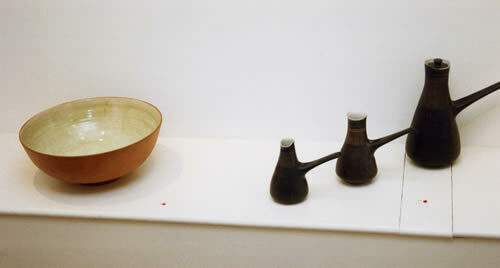 After 1948 she was able to use “stoneware glazes” upon stoneware. Even her unusual practice of glazing on the raw, unfired pot, was carried forward from her pre-War custom with earthenware. Nor have her glazes, and combinations of glazes, ever ceased to evolve. Who could have forseen, from her work in the ‘50s and ‘60s, the strong pinks, blues and greens that were to flare out and bloom alongside coppery-looking oxides on much of her subsequent work? Or that, even in some of her latest work, she could teach us to enjoy whole new varieties of experience in what our language so inadequately terms merely “white”? From what has been said it will be apparent that Lucie Pie’s work occupies a place, in the spectrum of ceramics created by her generation, far distant from that occupied by Hans Coper’s. This may help explain why their example, and their direct influence as teachers, proved so vitalising to British potters at a time when the impetus given by Bernard Leach was beginning to lose its force. Those studio potters who have successfully blurred the line between pottery and sculpture have found encouragement in Coper’s work. On the other hand those seeking reassurance, as the tide has flowed strongly in Coper’s direction and beyond, that constant renewal is still possible within the more central tradition of wheel-thrown pottery, have done well to bear in mind the example of Lucie Pie. Never flustered by fashion into changing her style, never lapsing into stale routine: what an example, what standards she has set! But effusiveness has never been to Lucie’s taste, so I will conclude quickly by wishing her a happy birthday.